← Seriously, Who do YOU want to inspire America’s Daughters ? LMAO! the clown wig! That was AWESOME! I don’t know which is better…clown wig or MOTUS and the Mickey Mouse ears! I’ll give both my vote!! I just saw MOTUS’ Mouse ears and the Leader of the Club sign …. LOL ! 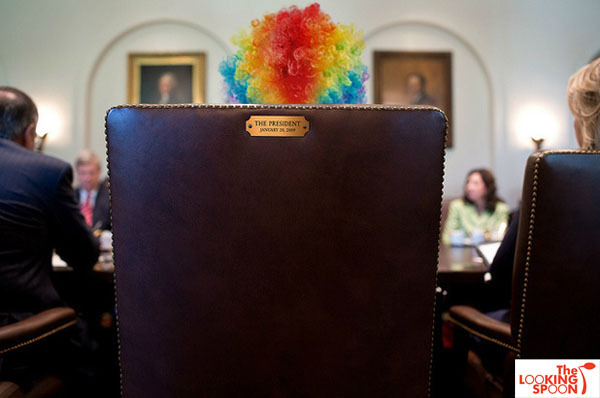 I want to see an empty suit in the empty chair. My vote is for the clown wig. Sending that photo out was incredibly stupid for Obama and showcased the Prez’s thin-skinned mean side. IMO, if he had the chance, Clint would have said the same things to MrO in person. Oh, but in front of a national audience with 15,000 reporters, priceless ! The post includes a video that is weirdly appropriate. Nevertheless, the music is beautifully done.